In Talking Mysteries Tony Hillerman discusses the craft of mystery writing, his approach to plot, characterization, and setting, and the wrinkles and twists that make his brand of fiction unique. 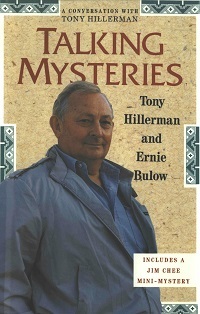 Included in this book are an extensive interview by long-time friend Ernie Bulow (who has made cameo appearances in three of the Hillerman novels) and an autobiographical piece by Hillerman detailing his early years in Oklahoma, first encounters with Navajo culture, and his eventful life as journalist and author. As an additional treat a Jim Chee mini-mystery, originally published in 1981 and long unavailable, is included here. This book contains twelve sketches of Hillerman characters by Navajo artist Ernest Franklin. Speaking of these, Hillerman recently thanked Franklin "for showing me what Jim Chee and Joe Leaphorn look like." There is also a map of the Four Corners country in the American Southwest marking locations mentioned in the mysteries.